Mobile Software Developers are obviously not impressed or affected with Android based smart phones taking over iPhone in sales figures for the last quarter in the United States this is vouched by the fact iPhone and iPad has the largest number of developers working for iPhone and iPad platform. The iPhone dominates mobile app development with more than half of mobile developers working on the platform. The Survey was carried out by IGR, a market strategy consultancy focused on the wireless and mobile industry, Fifty-three percent of the surveyed developers build applications for the Apple iPhone OS. 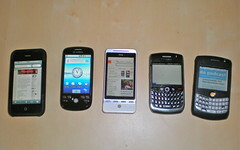 The next most popular platforms were RIM BlackBerry OS, Android and Microsoft Windows Mobile 6.5. A year ago Windows Mobile was by far the most popular OS. Developers generally develop for multiple platforms and are increasingly developing for more. Respondents currently developed for 2 to 4 separate platforms, a number that will increase to 3 to 4 over the next 12 months.